Discussion in 'Traditional Folders and Fixed Blades' started by CraigTbone, Mar 23, 2019. I have carried a pocket knife since about 4th grade, 50 some years ago. My first is a little jack that I bought from Sears. That is my letter opener at my desk. After a number of different knives over the years I am liking the Stockman pattern for EDC. 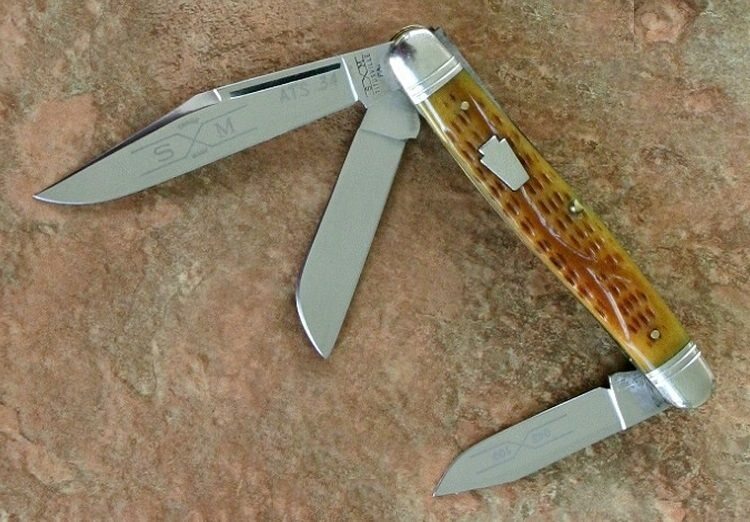 Case has an amazing variety of Stockman patterns. I like the rounded ends as a more pocket friendly shape and nicer on the hands. The clip blade where the nail nick is farther out on the blade than the clip break point on the back edge (is that a muskrat blade?) does not look right to me, looks fragile. 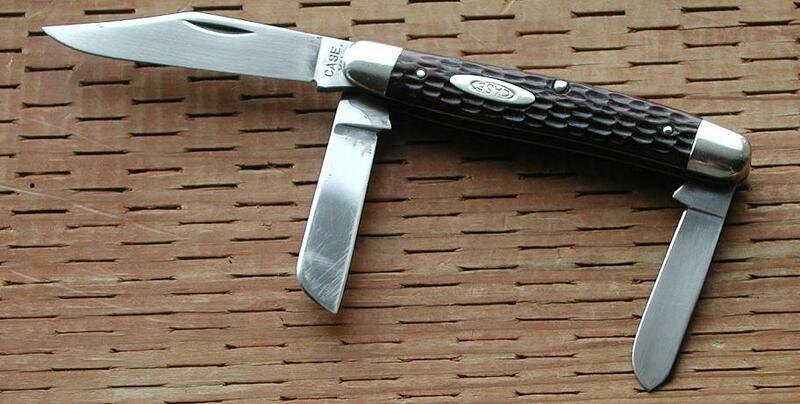 Case has both clip blade styles (conventional with the nail nick inboard of the clip and muskrat). I bought two Case Stockman knives, one with rounded ends & muskrat clip, and one with squared ends & conventional clip. 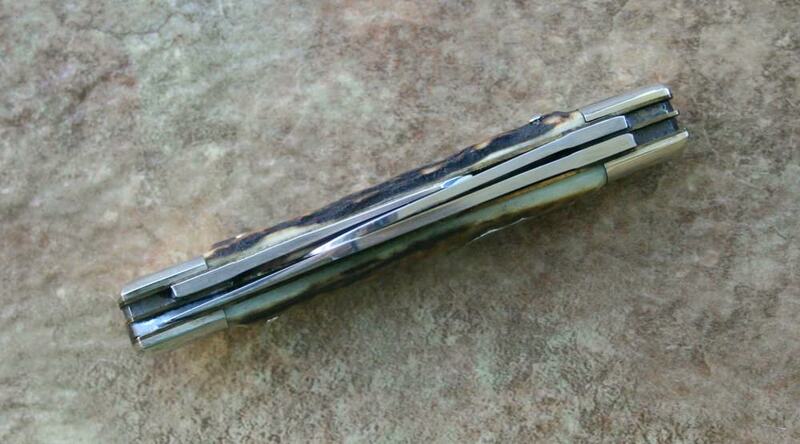 Then I found a Case with rounded ends & conventional clip. When I received it I was surprised to see that the sheepfoot and spey blades do not share a common spring but each have their own spring on different layers. With all other Stockman knives that I have seen, those two blades are angled so they fit into the same layer and use the same spring. This Case has thinner blades and they are not angled. I am also surprised that the spring strength on these two separate narrower springs seems to be greater than the wider single springs on other Stockman. I guess I am just curious about what is known about those two configurations. Historical background? Is that a Case only configuration? Are there any good or bad aspects of either configuration? UnderDawgAl, SVTFreak and Prester John like this. I cant help much with you, but I can sympathize. 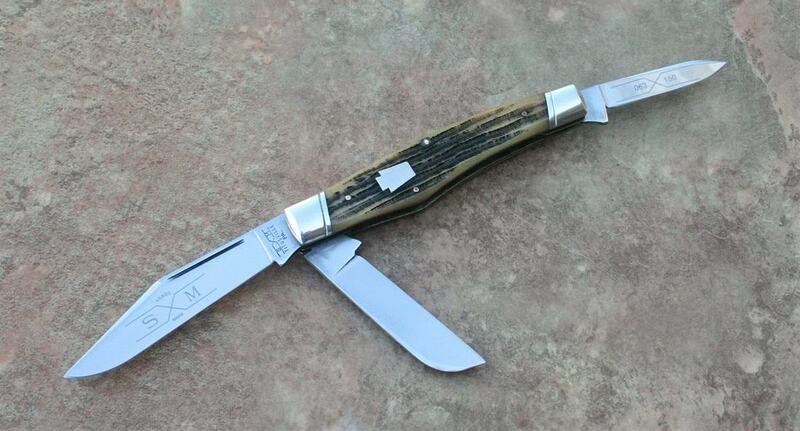 I too have specific tastes in stockman patterns and how the blades fit. I can tell you that spring strength isn't affected by the width, but also the thickness of it. So a narrow spring can be stiffer than the wider ones if it is thicker (does that make sense?). When they share a spring, the blades are often "crinked" to nest in. Some custom makers grind them offset to fit which looks nice also. 3 spring variants have more room and don't need the crinking but are thicker. Getting older and Prester John like this. I believe the three blades on three springs is a newer pattern, as it doesn't require as much hand fitting and krinking (bending) of the blades to fit past each other without rubbing. Three spring knives are a little thicker, but have straight blades, so both patterns have their proponents. I know that Case, Buck and GEC have all made three spring knives. Finding a knife with the spring tension, pull weight and snap, that you prefer may take some trial and error, as even knives within the same pattern differ. The third blade can also differ from spey to pen to punch to pen clip. scrteened porch and Prester John like this. I like a good Cattle knife. Same blades, cigar pattern. SuperHowl, Jathes, Eli Chaps and 4 others like this. R.c.s, CVamberbonehead, Dschal and 12 others like this. BUCK 301 in the rfp..
redsparrow, Prester John, afishhunter and 1 other person like this. Knice selection of stockmen (stockmans?)(stockpersons?). Jeff! Anyone which exact model from Case has the three springs? Thanks, Cal! Jstrange, I know the newer #47 patterns have three springs, as this one in Damascus from 2014. Mongo, R.c.s, Dschal and 9 others like this. Actually it is just the modern 47 pattern. I have some 47’s from the 70’s that are two spring configuration with crinked blades , I’m not sure when they added the third spring but I have quite a few of the three spring versions. The overall thickness seems pretty close to the two spring version but the blades are all much thinner, they are great slicers! I am a fan of both versions, at 3.875” closed and rounded bolsters they ride in my watch pocket nicely and fill my hand well. Eli Chaps and UnderDawgAl like this. Thanks, Josh, I like it a lot myself! I really like the strait spey on that #47, humpback spey blades are a real turnoff for me. I think my ideal stockman would be on the same frame as the mini Texas jack, with offset blades, a sheep's foot that's not sitting really high, and anything but a humpback spey. I believe the model number that I purchased is #00128. The sheepfoot blade has "6347" engraved on it. My order was placed about 2 weeks ago. Today it shows out of stock. Case retooled some of their patterns in the mid-eighties and mid-nineties. One of the knives they retooled was their 47 pattern in the mid 1990s where they utilized a 3rd spring. Here are a couple of 47 stockman with rounded bolsters. Both knives are 3 7/8". ISKRA, R.c.s, Dschal and 8 others like this. Don't have one yet, but I will. I do have it's functional equivalent. Dr-Mabuse, R.c.s, CVamberbonehead and 16 others like this. well heat-treated stainless steel, with pen third blade. Takes a screaming edge and has magnum walk & talk with 6-7 pulls and gator snap. Mongo, R.c.s, Dschal and 12 others like this. A stunning knife Jeff. That one looks good in all ways. 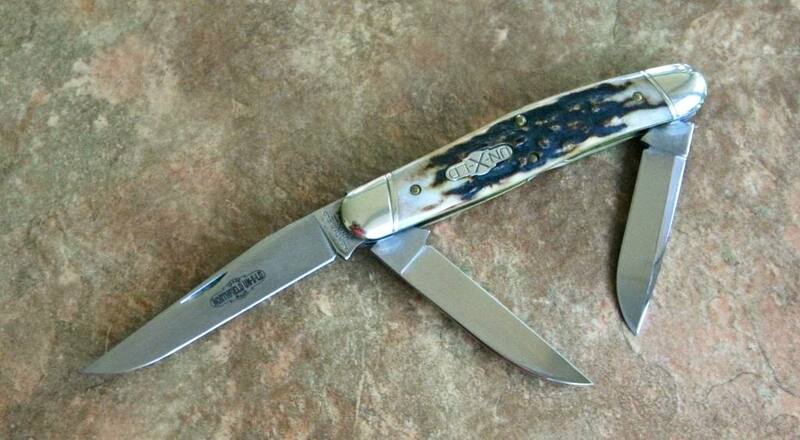 The 6347 was my first Case knife. 7-dot 1970 with red bone handles and nickle silver liners. Carried it for all of 10 minutes before I put it away for safe keeping. Still have it--along with many '47 siblings. I was shocked when I picked up a new one in 1993 with 3 backsprings. I think that was a low point for me and the '47 pattern. I was upset enough about it that I wrote a long letter to the production manager Bob Scudder at Case just after they were bought by Zippo. Actually received a phone call from Bob and we had a great discussion about some of the plans Zippo had for Case. Not trying to drive traffic away from Blade Forums, but I posted the letter here on All About Pocket Knives about 10 years ago. TheChunk91, Icky Thump, zolthar and 1 other person like this.